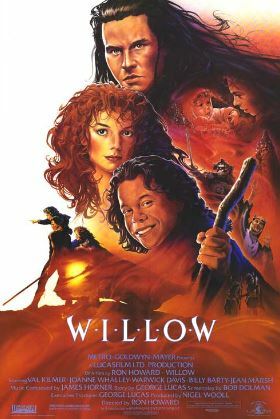 Rewatching the 1988 movie Willow scene-by-scene. Why? Because it’s freaking Willow! It’s time for another cross-country travel montage, 24:25-26:24 on the Blu-ray. We begin with a shot of Burglekutt walking out from behind a tree, wiping his hands on his shirt. Was he just using this tree as his bathroom? Let’s hope not, because he walks over to two of the others and has a bite to eat. The camera mercifully pans over to Willow, tending to the baby. He hears a dog howl, and then sees two NockMaar soldiers in the distance, riding toward them. Vohnkar of course is the first to leap into action, ordering the others to “Move!” The rest of the Nelwyn quickly gather their things as the riders get closer. The big question here is if the Death Dogs are such great trackers, then why did they just run past when the Nelywn and the baby were right there? If Willow has latent magic powers he’s using without realizing it, perhaps he’s unknowingly using magic to protect the baby. Maybe, just maybe, this also explains how the movie gets away with the hearing-exactly-what-you-need-to-hear-while-eavesdropping cliché. Another question is how these guys can report to Sorsha, when in the previous scene we just saw Sorsha at Castle NockMaar, half a continent away. I guess we’ll have to assume he means they’re reporting to Sorsha’s officers. Another big question is the reference to the NockMaar claiming to have searched the Nelwyn village. Is this referring to the Death Dog that attacked the Nelwyn festival, or did the NockMaar raid the village during the montage? Again, the movie references major events that we don’t see. Vohnkar is again all business, saying “Come on, we’ll keep to the woods.” Remember that the High Aldwin instructed their group to follow the river, and this line suggests they are no longer doing that. The High Aldwin never actually specified the Daikini crossroads as their destination, but we’re about to see that’s still their goal. Next we get the second half of the Nelwyn’s travel montage, which started a few scenes ago. First is a very Lord of the Rings-ish shot of the Nelwyn marching single file in silhouette along a mountaintop with taller mountains in the background. Then there’s a shot of the group sitting around the campfire sharing a meal, and this is where the score switches from suspenseful to uplifting, telling the audience they’ve successfully escaped. After that, the group is crossing a log across huge chasm of two cliffs, and then them walking among some large trees. The montage ends with an odd shot of the Nelwyn emerging from an opening in a group of chalky white trees. Is this some sort of hidden entrance to pathways eventually leading to the Nelwyn village, or just the group’s way of staying out of site? Vohnkar leads the way, and announces “There it is! The crossroads!” The music stirs, but then cuts out as we see these “crossroads” are a rickety wooden structure with two large cages hanging from it. That’s where we’ll pick things up next time.